Effective May 24, 2011 - Go Casino, Online Vegas Casino Grand Vegas Casino, Crazy Slots Casino will no longer be accepting any new players. Players who registered for real money accounts prior to this date will be able to continue playing. New players wishing to play at these brands will not be able to register and or create an account. If you'd like alternate online casinos to play at please visit the homepage of our site. Effective May 16, 2011 - Millionaire Casino, VIP Slots Casino, Slots Galore Casino, Super Slots Casino, English Habour Casino and Caribbean Gold Casino will no longer be accepting any new players. Players who registered for real money accounts prior to this date will be able to continue playing. New players wishing to play at these brands will not be able to register and or create an account. 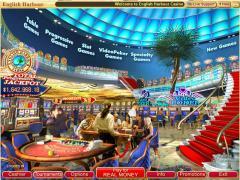 If you'd like alternate online casinos to play at please visit the homepage of our site. Vegas Technology formerly OddsOn is a software development company with development offices in Toronto Ontario. Established in 1998 they have thrived as top tier online casino software provider bringing forth a terrific array of casino games in a secure and fun filled environment. With a fully featured suite of casino games they currently offer over 90 exciting games to choose from and play ranging from 3 reel slots, video slots, progressive games and a great selection of table games to choose from and play. Both a download version and instant play no download version of Vegas Technology software are available giving you a choice of downloading and install their casino software on your computer or play from a web browser. Either option is just as compelling offering easy navigation throughout the casino making it easy to find your favorite games. One thing that we should really emphasize is that the download version of software developed by Vegas Technology is that it downloads fast and by fast we mean fast. The average game offered by other online casino software providers is around 7MB per game taking approximately 5 - 15 minutes to download based on the speed of your internet connection. Vegas Technology software on the other hand has an average game size of approximately 1MB thus downloading in between 1 - 4 minutes based on the speed of your connection. So as you can see with Vegas Technology software you'll be able to get up and running much quicker then other software platforms. In addition to the great games, fast downloads and overall great software platform Vegas Technology casinos also typically offer tournaments and are the pioneers of casino game type tournaments online. 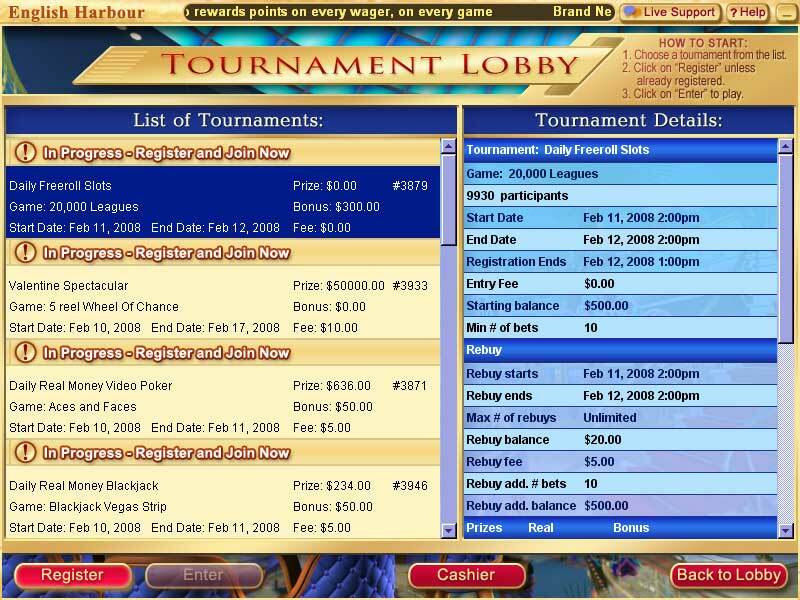 With small buy-ins as low as $10 Vegas Technology casinos give players the ability to enter into multi player tournaments at a chance of winning over $5,000.00 per tournament. Tournaments run regularly and are available for popular casino games including slots and blackjack. The slots tournaments especially those offered at the casinos operated by the Golden Casino group are quite large at times. It's wise to check back with us here on Casino Advisor from time to time and view the featured casino tournaments, where they're happening and all other relevant details. 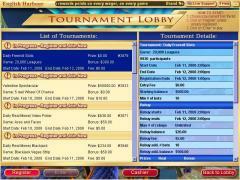 Often times there are free roll tournaments meaning that you can get into the action for free at no expense. Also most of their tournaments are "Guaranteed" tournaments meaning that if they say that $100K is guaranteed it means that even if the tournament prize pool doesn't reach this amount that they'll cover it as a casino out of their own pocket. Interested in reading more detailed information about Vegas Technology? If so Click Here for more details.